On April 3, Survey scientists and staffers were recognized at a luncheon in the Indiana Statehouse atrium for their work on the statewide Lead Sampling in Schools Program. More than 900 public schools have enrolled in this proactive program overseen by the Indiana Finance Authority (IFA), who awarded a grant totaling more than $2 million to the Indiana Geological and Water Survey to conduct the sampling. Governor Eric Holcomb and Jim McGoff, Director of Environmental Programs at the IFA, praised the work of the IGWS in setting up the testing protocol and providing much-needed data about the presence of lead in school drinking water fountains and other fixtures. A staff of 60 technicians, led by IGWS hydrogeologist Sally Letsinger, continues to conduct sampling throughout the state. A final report detailing the project results will be available in January 2019. 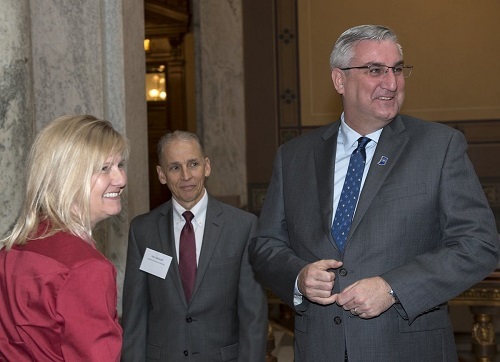 From the left, IGWS Hydrogeologist Sally Letsinger, IFA's Jim McGoff, and and Governor Eric Holcomb. Landmarks of Indiana: A Timeline, a new offering in the IGWS Digital Information series, illustrates the unfolding of Indiana’s history of the science of geology. This online story map---a combination of maps, text, and historic illustrations and photos---features noteworthy events, scientists, places, publications, buildings, and industries that are part of Indiana’s geological legacy. Beginning in 1787 when the Northwest Territories were established, the timeline transports you to the time of the New Madrid earthquakes, through the Trenton Field's gas and oil boom, to the beginnings of the Indiana limestone industry, up to the present. 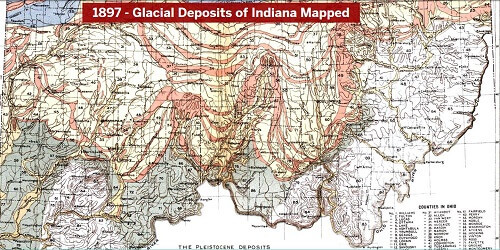 In 1897, Frank Leverett publishes the first map of glacial deposits in Indiana, part of his study of water resources. Make Plans to Attend GSA in Indianapolis! The IGWS is hosting the 2018 Annual Meeting of the Geological Society of America (GSA), from November 4–7 at the Indianapolis Convention Center. These meetings regularly draw more than 6,000 geoscientists from around the world to participate in hundreds of workshops, short courses, technical sessions, and field trips that span the earth sciences, including education and public policy. More than 20 geoscience field trips will be held across Indiana and the Midwest. Participants will learn about the region's unique geology, such as the history of glaciation, evolving dunes and lakeshores, the production of dimension stone, and labyrinthine cave systems. No, we're not predicting any seismic activity on June 9 at Conner Prairie. But you can experience the shaking that takes place from a magnitude 7.0 earthquake in the Quake Cottage, the IGWS mobile earthquake simulator. Nicknamed "Quakey," the Quake Cottage mimics the shaking experienced during earthquakes having magnitudes ranging from 3.0 to 7.0. Definitely not a carnival ride, the cottage demonstrates the effectiveness of preparing for a quake. The Quake Cottage travels around the state giving Indiana's citizens information about how to prepare for a possible earthquake. A new story map speaks to the possibility of using underground coal gasification (UCG) in Indiana. In the UCG process, the gasification of coal takes place underground in the actual coal seam instead of in a gasifier at the surface. 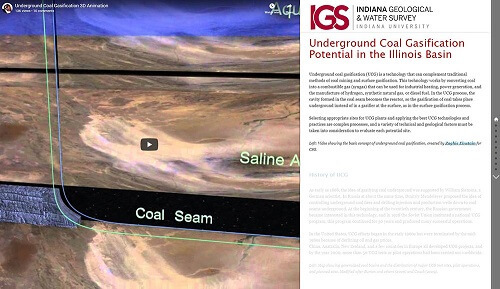 The site features a video explaining the basic concept of UCG, as well as maps of available coal in Indiana that may be suitable for this technology. Visit the site by clicking on the graphic above. The IGWS is participating in a number of outreach events over the spring and summer. This is a partial list; please check the local venues for more information. Scroll down to find even more events in our Events Calendar! June 6: Program at Alexandrian Public Library in Mount Vernon; participants will make and take their own rock boxes and learn about Indiana bedrock geology. June 12: Program at St. Joseph Public Library in South Bend. June 15: Program at Washington Carnegie Library in Washington. July 14: Program at Jasper-Dubois County Public Library in Ferdinand. July 21: Dino Day at Plainfield-Guildford Public Library in Plainfield; participants will learn about Indiana's fossil history. 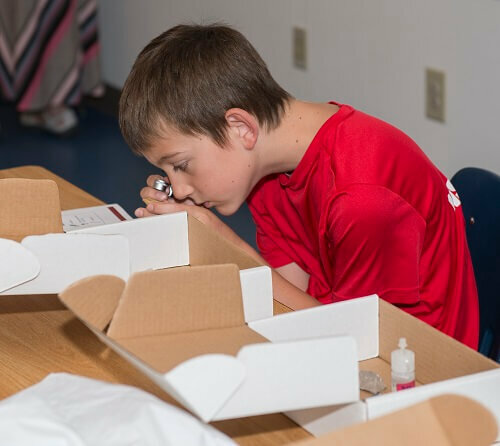 July 28: "Be a Scientist" at Monroe County Public Library, Ellettsville and Bloomington branches; participants will discover the role of technology in paleontology. Last year, IGWS educational outreach efforts connected with more than 13,000 children and adults in Indiana and beyond. Click here to send us any feedback, comments, or story ideas!